I was looking for a way to be able to deploy a Co-management policy with only Windows Update policies workload to a specific collection. This in order to transition a smaller amount of computers (who are not a member of the already existing Pilot group) to be controlled via Intune instead. In the Configuration Management console I was not able to create multiple Co-management policies so I thought that this was not possible to do. But then I found this great article describing the exact scenario I had and so I went ahead and tried it in my environment which worked like a charm. All the credits goes to Cody Mathis and his original article about this topic. So what do I need to do this make this possible? We need to use Powershell to create a new Co-management policy with the cmdlet New-CMCoManagementPolicy. We can then rename and deploy the policy to whatever collection we want. Isn’t that awesome? In this example we will create a policy with the WufbWorkloadEnabled which will only activate the Windows update policies on the specific collection of our choice. Other Workloads can be set be using the following parameters. Office Click-to-Run apps = Doesn’t have it’s own parameter so you need to create that via an XML instead. Very well described in Codys article (link above) so I won’t write about that in this post. If done correctly the policy should now be deployed to the collection you defined in the commands above and you should see it like on the picture below. On the computer you can now see that the new Co-management policy (CoMgmtSettingsPilot-WUFB) has been applied in configurations tab (control smscfgrc). Please note that you can see multiple CoMgmtSettings depending on your configuration. 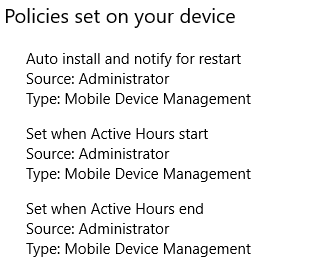 We can also see that the Intune policies have been applied to the computer (Settings > Update & Security > View configured update policies > Policies set on your device). Other articles about Configuration Manager and Intune.